I went to class today because, believe it or not, Thanksgiving isn’t a national holiday in Bolivia. Fortunately, I have some experience with Thanksgiving away from home. In the past four years, I spent two Thanksgivings at my aunt and uncle’s house in Indianapolis, one in Dublin, and one at the Notre Dame health center with pneumonia. When it comes to traditions, though, what you do is more important than where you do it. This year some of the U.S. students at the Institute decided to have a potluck style Thanksgiving. I volunteered to make candied yams since they’re one of my favorite foods. From the get-go, I ran into some problems. For one, I come from the school of cooking philosophy that says you just have to read and follow directions in order to cook. But the speedbump came as I read various recipes online. “I’m supposed to cook them until they’re candied? What does that mean? Should I wait until it looks like a Snickers bar?” Reading the instructions is hard if you can’t understand them. Problem number two was related to ingredients. I couldn’t find any brown sugar; it’s uncommon here. Caitlin took care of that though when she found some imported from the U.S. Next, I couldn’t find any yams, so I had decided to replace them with camote, a local sweet root. But there was a shortage at the supermarket so my host mom Juana and I went to the local market in search of camote. I returned successful, like a proud hunter bearing his slaughtered root vegetables. In any event, to make a long story bearably short, I cooked up a batch—perhaps the first ever—of candied camote and took it to our 7:00 dinner just in the nick of time. Roy brought a fantastic turkey; Emily brought cornbread; Caitlin brought apple crisp. 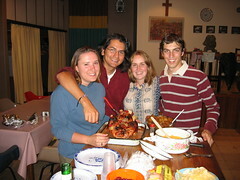 Each of seven other students from the U.S. brought a dish and among us we put together a good Thanksgiving dinner. We ate together and enjoyed a night of North American food for a change.